This is the second part of the tutorial on how to program an AVR ATTiny85 chip with Arduino Uno. All the hard work has already been covered in Part 1, so make sure that you have completed the steps in that section before you continue! 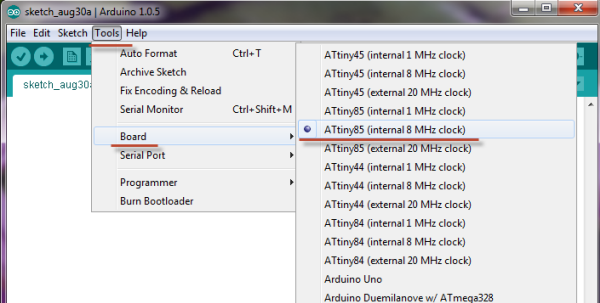 Open the Arduino IDE and go to “Tools” -> “Board” and select the option “ATTiny85 (internal 8 MHz clock)”. Go to “Tools” again and select the option “Burn Bootloader”. You should see a message saying “Done burning bootloader.” You may get an error “avrdude: please define PAGEL and BS2 signals in the configuration file for part ATtiny85”. You can ignore it for now. Dear Sir, how could we ignore the “avrdude:”? The whole program does not work! No LED functioning!